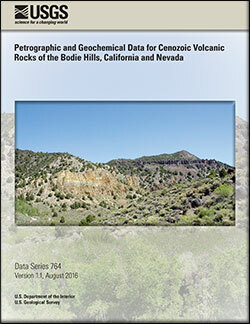 This report presents petrographic and geochemical data for samples collected during investigations of Tertiary volcanism in the Bodie Hills of California and Nevada. Igneous rocks in the area are principally 15–6 Ma subduction-related volcanic rocks of the Bodie Hills volcanic field but also include 3.9–0.1 Ma rocks of the bimodal, post-subduction Aurora volcanic field. Limited petrographic results for local basement rocks, including Mesozoic granitoid rocks and their metamorphic host rocks, are also included in the compilation. The petrographic data include visual estimates of phenocryst abundances as well as other diagnostic petrographic criteria. The geochemical data include whole-rock major oxide and trace element data, as well as limited whole-rock isotopic data. du Bray, E.A., John, D.A., Box, S.E., Vikre, P.G., Fleck, R.J., and Cousens, B.L., 2016, Petrographic and geochemical data for Cenozoic volcanic rocks of the Bodie Hills, California and Nevada (ver. 1.1, August 2016): U.S. Geological Survey Data Series 764, 10 p., https://dx.doi.org/10.3133/ds764.